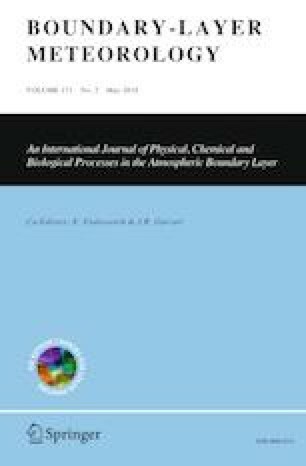 Turbulent flow and reactive pollutant dispersion in the convective boundary layer (CBL) over flat and urban-like surfaces are investigated using a large-eddy simulation model with NO–NO2–O3 chemistry, with the urban-like surface represented by a block array. The CBL over a flat surface with and without ambient flow (FW and FNW cases, respectively) and the CBL over a block array with and without ambient flow (BW and BNW cases, respectively) are simulated. Wind shear in the entrainment zone increases the turbulence intensity and enhances the heat exchange in the entrainment zone. The urban-like surface induces greater wind shear in the entrainment zone, thus the largest turbulence intensity and heat exchange are found in the BW case. High NO concentration appears in updraft regions, whereas high O3 concentration appears in downdraft regions. The segregation of NO and O3 reduces the O3 decomposition in the CBL. The magnitude of the vertical gradients of NO, NO2, and O3 concentrations in the entrainment zone is smallest in the BW case, indicating that the largest reactive pollutant exchange occurs in the BW case. It seems that the greater wind shear in the entrainment zone induced by the urban-like surface also enhances the reactive pollutant exchange in the entrainment zone. The magnitude of the O3 production rate in the entrainment zone is large due to the mixing of mixed-layer air with air in the entrainment zone, especially around updraft regions. Since the segregation of NO and O3 interrupts the O3 decomposition, the turbulent component of the O3 production rate is generally positive in the CBL. The reduction of the O3 decomposition due to the segregation in the entrainment zone is smallest in the BW case. The effects of segregation on the chemical reactions are reduced due to the strengthened turbulent motions in the BW case. The authors are grateful to three anonymous reviewers for providing valuable comments on this work. This work was supported by Basic Science Research Program through the National Research Foundation of Korea (NRF) funded by the Ministry of Science and ICT (No. 2016R1A2B2013549).